A Long Island Rail Road train derailed in New Hyde Park Saturday night, injuring 33 people. Of the 33 injured, seven were employees and the rest were commuters, MTA Chairman Thomas F. Prendergast said in a news conference Sunday morning. Four were seriously injured, with one person sent to have surgery yesterday and another with broken bones. Gov. Andrew Cuomo had earlier said there were 600 people on the train and that the worst of the injuries were broken bones. 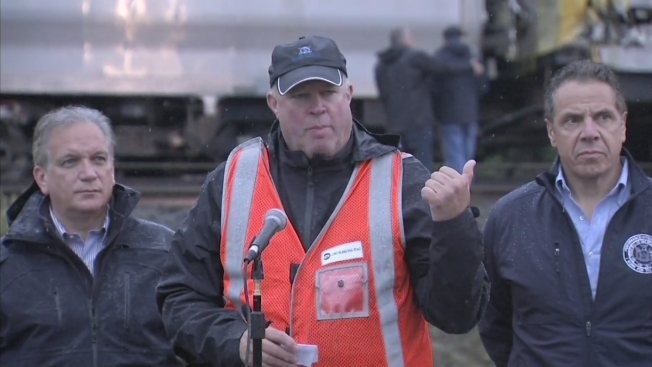 "The train is seriously off the tracks," he said at the press conference. "It's in a dangerous, precarious position." An eastbound commuter train sideswiped a work train traveling in the same direction at about 9:10 p.m., causing the commuter train to derail and the work train to catch fire, according to Nassau County police and the MTA. Cuomo said the main priority will be to clear the trains from the tracks and to get at least one track running as soon as possible. "If we have to work all day and all night long, we will," he said. "We want to make sure tomorrow's commute is as easy and normal as possible." Photos on social media showed trains tipped at an angle next to the tracks and smashed glass inside at least one car. Emergency crews were using ladders to get passengers off the derailed train. A damaged and partially derailed Long Island Rail Road train after a collision near New Hyde Park on Oct. 8, 2016. "So the train was going normally, it was going at its normal speed, and then it started to shake, but that’s sort of normal, and then everyone started to sort of scream – so I realized something was wrong," Lindsay Javitz, who was on the derailed train, told NBC 4 New York. "And the train was really (going) back and forth and shaking … and then I look out the window and I saw a spark or a fire type thing … and then the train abruptly stopped and the car in front of mine was tilted, as if it wasn’t fully on the track." The LIRR said three cars derailed and were damaged. According to the MTA, the tracks are generally wide enough for trains to travel side-by-side. The agency is investigating why the collision occurred. Service was suspended on three branches of the railroad and there was no estimate on when trains would start running again. Limited alternate service is available to and from the Hicksville, Ronkonkoma and Port Jefferson Stations. A diesel shuttle train will operate between Hicksville and Babylon. Transfers can be made at Hicksville for trains to other destinations. Limited bus service will be provided between Jamaica and the New Hyde Park, Merillon Avenue, Mineola, Carle Place and Westbury stations. Bus service will also replace some trains on the Oyster Bay Branch line. For more information, commuters are advise to check the MTA website for service updates. The LIRR is the busiest commuter rail in North America, carrying an average of 300,000 people each weekday. The accident comes three days after a CSX derailment in the Bronx caused widespread Amtrak delays, and about 10 days after a deadly New Jersey Transit crash in Hoboken that continues to snarl service.